Valve seat machining: All our cylinder head valve seats are machined with our 3 angle Serdi valve seat machine and are vacuum tested to ensure a perfect seal every time. 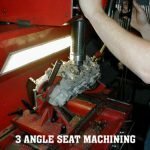 In our cylinder head machine shop we guarantee our valves and seats are machined for a perfect fit giving maximum performance and long life to your valves. UMR Engines has over 40 years experience as a cylinder head machine shop. We can supply fully reco exchange heads or repair your cylinder head to suit your requirements. 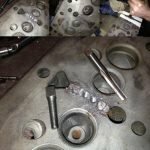 Aluminium welding: We can repair corroded out water jackets, weld and repair damaged or corroded combustion chambers, weld and repair cracks using a high quality Tig welder. 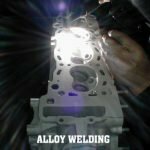 It is important that a cylinder head machine shop has highly experienced tradesman to carry out welding repairs. Our cylinder head machine shop has Lindsay overseeing all aspects of the cylinder head repairs and has been an important part of our team for over 30 years……Quality repairs that last. 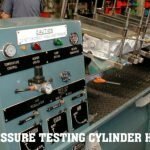 Pressure testing: We can pressure test cast iron or aluminium cylinder heads, blocks, oil coolers, etc. If your trying to find the problem with water in your engine oil, or engine oil in your radiator, we can test your engine components. Our pressure tester is equipped with a heater element that heats the water system to around 90 degrees Celsius and with 30 PSI of pressure it will more than simulate operating conditions. In our cylinder head machine shop we carry out both a cold & hot test to guarantee results. 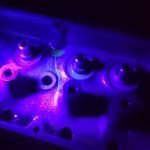 Ultraviolet crack detection: We can carry out an ultra violet crack test on your cast iron cylinder head. We recommend this process on all cast iron heads especially diesel cylinder heads and early model Holden’s, Ford’s and Chev’s as they are prone to cracking. In our machine shop we recommend crack testing all cast iron heads as the foundation to any repair work. Cracks unseen by the naked eye are clearly visible during an ultra violet crack test. For over 40 years UMR Engines Slacks Creek – Brisbane has been providing business & private clients professional cylinder head machining. Our cylinder head machine shop is fully equipped to recondition a large range of cylinder heads with our modern equipment and machinery which makes it possible to provide a high quality job every time. We commence with carrying out a visual inspection, hardness test (aluminium heads), check for straightness and vacuum test valves to ensure positive seating. If reconditioning is required, we then dismantle, clean and assess the cylinder head prior to contacting you with a price on reconditioning including any parts that need replacing and any extras like welding, straightening or inserting if required. We will require valve stem seals to reassemble your head which you can supply or we can provide a quality Valve Regrind Set (VRS) at a competitive price.